After months of internal testing, Google has released the next version of Google Search. It has been rumored for a while now that the change would be coming, there just wasn’t too much being said about it. The redesign isn’t anything that will knock over with amazement, all the changes are for the most part are subtle. The biggest change that I noticed right off the bat was the new left-hand navigation bar. When your results are returned by Google you will notice that the sidebar is a lot more compact, your will really just see 3 options at first. 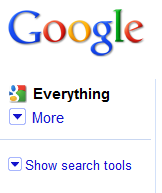 The natural thing to do is quickly click on MORE button, which opens up all your new search options. Its basically same as the Google services menu you see at the top of a Google page, but this adds some graphical icons and more search choices, like Books and Blogs. Finally the Show Search Tools is where all the users options are now located, there are all kinds of options the users can toggle. I like the new Standard Results options, this allows you add more or less shopping results and a cool page preview option. 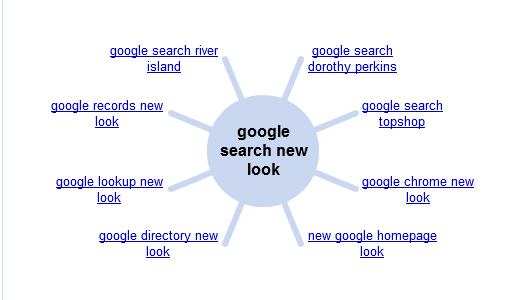 One other new feature that caught my eye was the Wonder wheel, it looks like it gives you related search terms to the original search query you entered. It’s definitely something to check out. The other thing Google updated was their “Google” logo, it now has minimalistic look to it, but at the same time it stands out at you. “In addition to the left-hand side changes, we’ve updated our look and feel in terms of our color palette and our logo. These changes are slight, keeping our page minimalist and whimsical, but make our overall look more modern.” is how Google described the new logo in their updated blog post. I guess the way to see all the changes, is experience it for yourself. Open up Google.com, search for whatever you want, and play around with all the new features and the new layout. I think you might be pleasantly surprised. One last thing, there is no way to revert back to the old Google search layout, so you will have to get used to it. Here is a little video overview of the changes Google made, the video was done by Google themselves. I’m happy they finally released the new search. I’ve been using the beta version for sometime now and I really missed it when they turned it off weeks ago. Really dislike the new layout. There should at least be an option to hide the sidebar. I’ve been reading a number of forums and there is pretty wide ranging consensus that the users want the old layout back. I hope google listens.